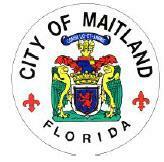 Notice: More than one member of the Maitland City Council may be present at this meeting. Any person who desires to appeal any decision made at this meeting or hearing will need a record of the proceedings and, for this purpose, may need to ensure that a verbatim record of the proceedings is made which includes testimony and evidence upon which the appeal is to be based. Persons with disabilities needing assistance to participate in any of these proceedings should contact the City Clerk's office (539-6219) 48 hours in advance of the meeting.